Below is our latest post for BrickUnderground.com containing our advice on buying kitchen cabinets. But first, here is a bit more detail on our shopping experience at Home Depot and IKEA for those trying to decide where to purchase cabinets. We started out first looking at IKEA cabinets and for the rental unit and although the price was right there was little design assistance, their computer software (which you can download on ikea.com) is rudimentary at best (but good for planning) and there was a limited selection in cabinet sizes. With our irregularly high ceilings we couldn’t design them to fit. And don’t forget, the cabinets do not arrive assembled. That being said, we have friends who installed IKEA high gloss cabinets in a very modern newly constructed kitchen and ten years and two children later they’ve stood the test of time with only minor replacements, so whether IKEA is right for you is relative. 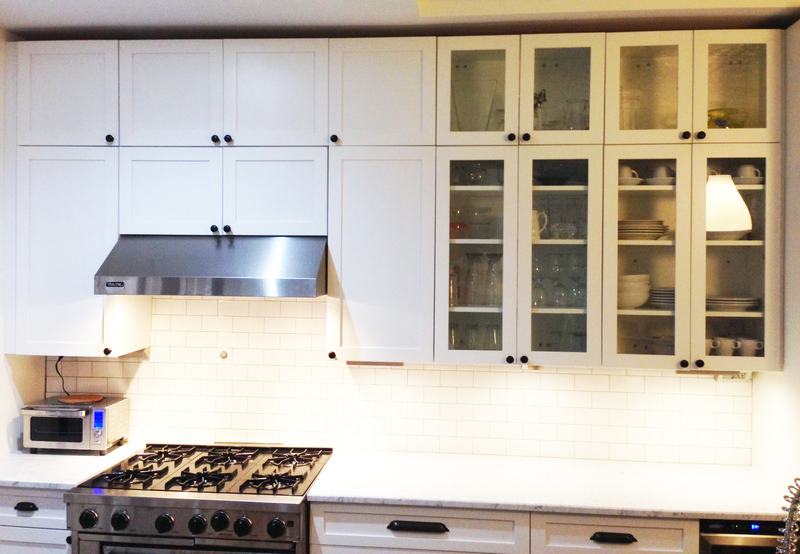 When we renovated the kitchen in our previous apartment we went to the 23rd Street Home Depot in Manhattan to check out several kitchen designs and materials in person We dealt with a different person at each process. Someone who is not the designer came to our home to measure the space and later when we needed a cabinet door replaced because it was warped we dealt with someone completely different in customer service. Also they subcontract installation to a third party, which lead to a problem when we installed our cabinets because our kitchen was measured with the old cabinets and drywall in place. We handled demolition and had the room re-drywalled. During this process one of the dimensions of the room increased by two inches. As a result our cabinets did not fit the space as designed. Thankfully, the installer was able to add filler pieces to solve the problem but it did not look exactly as we designed. We purchased full-overlay cabinet doors but see the gaps between the cabinets on the right and left below. While we were satisfied with the cabinet quality and service overall, we chose to go the small shop route this time because we wanted to work with one person for the entire process. For both our kitchens, the designer at Park Slope Kitchen Gallery came by and measured our space twice to make sure it was accurate before finalizing the order. For more information about what style and type of cabinet to buy see our post below. Our kitchen cabinet odyssey involved a lot more decision-making than you might imagine. Longtime New Yorkers Angela Tiffin and Andrew Nichols bought their first brownstone in South Park Slope in May 2012, and have spent two years renovating—first, their own duplex apartment and in recent months, a third-floor rental unit—much of it with their own hands. You can read more about the project at their blog,Brownstone Cyclone. This entry was posted in February 2015, Uncategorized and tagged contractors, demolition, kitchen by Angela. Bookmark the permalink.